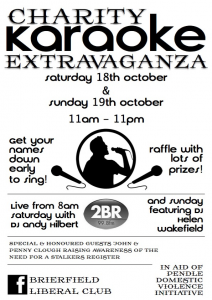 We would like to thank everyone at Brierfield Liberal Club who raised over £800 for PVDI in memory of Jane Clough at their Two Day karaoke Extravaganza event on October 18th and 19th 2014. Jane’s parent’s, John and Penny Clough, opened and closed the event on both days in memory of their 26 year old daughter who was stabbed 71 times at Blackpool Victoria Hospital where she worked, by her ex-partner Jonathan Vass in July 2010. A huge number of people took part in the event and Positive Action in the Community Trustee, Andrew Dewhurst was proud to accept a cheque on behalf of PDVI. Emergency items for people who have had to leave home quickly and leave possessions behind. You can donate online at the My Donate website. To get in touch to discuss donating or fundraising for PDVI please contact the project manager on 01282 726001 or email pdvi@p-a-c.org.uk. PDVI is happy to hear from people who would like to volunteer with us. Volunteers will need to pass an enhanced DBS (formerly CRB) check and will need to be able to commit to regular times which meet the needs of our client group. We are unable to accept current clients as volunteers, but are happy to hear from former clients who would like to help. Our volunteering policy is available here. If you are interested in volunteering please contact the Project Manager.